Situated at 604 meters above sea level between Sordo and Torbidone rivers, the town of Norcia,is the largest town of the Nera Valley. The city's origins go back to ancient times: already during the Punic wars between the Romans and the Phenicians, Norcia was very important as has been recorded by Roman historians. Later, during Roman times, the town gained political importance: first, as prefecture and then as a township. Upset by the Longobards and then by the Goths, it later recovered and became an active town during the Middle Ages. Its storical treasures have been damaged for the major part by the very frequent earthquakes which during the centuries devasted the town. In fact the first recorded earthquake dates back to the first part of the 6th century. However, due to a very meticulous restoration, the city is now able to show its original structure, with its splendid medieval architecture. As the town of Cascia, Norcia was the birth-place of a great religious personage: St.Benedict who was the first monk of Christian faith and the founder of the Benedictine order. He lived at the end of the 6th century between prayer and the humility of work, as he himself synthetized in his famous words: "Pray and Work". There are offers for hotels in the areas of Norcia! Click and Consult them immediately. The city is also famous for the restaurants which offer the typical regional cuisine and for its important works of art. The Gothic church of St. Benedict, is impressive, built in the shape of a Latin cross with a poligonal apsis and with a beautiful ogival portal. Its interior is built on two levels: above, you'll find the main church while the crypt is to be found below. Inside, you'll find precious frescoes and paintings dating back to the 16th and 17th centuries. The outside of the church preserves its original structure in only one part of the facade. A portico gives movement to the right-hand lateral side of the church until the bell-tower. The Cathedral dates back to the Renaissance period; unfortunately, not much of the original building has remained, as restoration during the baroque era has changed its architectural style. Another impressive example of Renaissance architecture, this time civil, is the "Castellina", a four-sided strong-hold built by Vignola and nowadays seat of the Municipal Diocesan Museum. 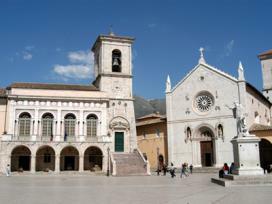 Would you like to visit Norcia? Here is a list of the best Nera Valley's farm-houses >> Find Yours! The church of St. Augustine, worth a visit because of its ogival portal which in its lunette contains a well-preserved fresco of the Madonna and Child with St. Augustine, and that of St. John, which, not like the former, has lost its original structure because of modifications during the baroque era, both date back to the 14th century. The church of St. Francis with its rose-window which opens upon its facade, is also noteworthy. Near Norcia, the small town of Serravalle offers the magical atmosphere of a village lost among the green Umbrian hillside. 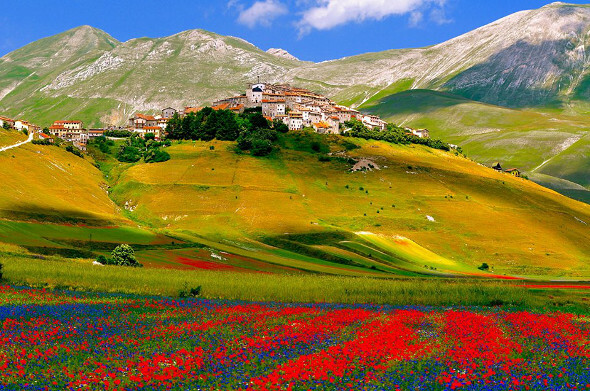 For trekking lovers and walkers, the plain of Castelluccio offers a truly unique spectacle, in particular during Spring-time when the meadows, because of the flowering, assume a thousand different tonalities mixed together in a multitude of colours. Trekking riding donkeys, water rafting and lots of funny activities for your stay in Norcia >> Look what to do in Norcia!